I've taught myself. My Secondary (High) School art teacher told me 'cartoon are not art' and so I had no interest in perusing 'art' classes any further. At about 13 I began to draw every day, less studying, more drawing what came to mind, creating characters and worlds and getting my thoughts and feeling onto paper. I joined deviantART at 15, and the feedback and critique I've gained through sharing my art online has helped a lot in my improvement. I wasn't born with any 'gift', unless you count functioning hands, I learned through practice. My early drawings are just as bad as everyone else's (I keep them as proof) I am nowhere near finished my learning, and now I actively study more and look to develop my skills further. I've always enjoyed creation; to draw something into existence from imagination is intoxicating. 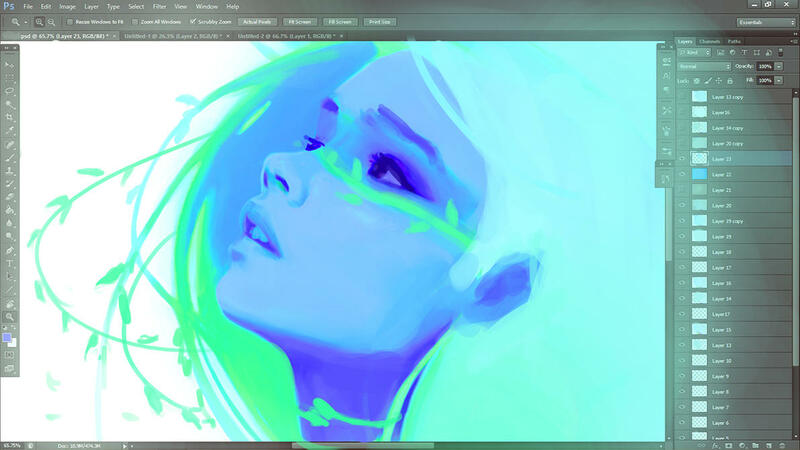 Mostly I use photoshop CS6, with a little Paint Tool SAI. Almost all the art I post online is done digitally from scratch now. This is by far the question I get asked the most, so I urge you to remember a program will only draw what you tell it to! Practice will get your further than any expensive program can. I use a good old mechanical pencil and cheap sketchpad for my doodles and practicing, I take it everywhere I can and draw as much as possible. Where do you get your ideas/ creativity from? I have an overactive imagination~! I also take time to explore things I find interesting from the world around me and my internal thoughts and emotions. Creativity is an active thing, to get better at it you have it exercise it! Sketching, Doodling, writing; for creativity to happen you need to create. Keep it in your mind you want to make something more unique than 'pretty girl standing there' and you will. My inspirations come from all over, a lot of my drawings relate to my life in some way, and my experiences and observations. How come you art is so emotive? I think an artist often speaks about themselves and their life through their art. Like most people, certain aspects of life has been pretty rough, when I started drawing both dark and light things I experienced crept into my drawings. When a particularly tough situation developed in recent years, while I was trying to stay strong I developed depression. It's hard to explain what that felt like... to have hell come inside your own head. But I came through it, and am through the worst of it now. It's developed me much as a person, and as such has had a influence on my artwork. Don't let some of my darker work fool you; I have an optimistic outlook and I enjoy so much of life. During the hard times I used drawing as an escape, a way to vent and put my story on paper, to be constructive with the destructive thoughts. It helped so much. Through the hard experiences I can truly appreciate happiness and how many blessings I genuinely have. I don't dwell on the painful, but I do let it influence me to create. Why don't you upload things more frequently? I have also been dogged by mental ill health in the last few years, which has had a server impact of my ability to output anything. Do you do animation or have you got a comic? How do you plan out drawing? It starts with the idea, sometimes it's fully formed, sometimes just a seed. To know if it's going to work and how to best convey my message I draw thumbnails, tiny canvases where I block out the main elements of the drawing. I do quite a few variations to see which translates the best. When I'm happy with overall layout I do a quick rough sketch keeping in mind composition and flow. What size canvass do you work with? 3000 pixels or there abouts, that should be big enough for most print media, you should work large as you can always scale down for web later, but it's harder to scale up as you lose detail. How do you make your lineart? Carefully! I zoom right in and using a hard brush carefully draw in the lines. I recently discovered SAIs 'smoothing' tool, where the cursor drags behind your stroke a little and gives a really nice wobble-free line. The trick to getting clean lines generally is taking your time. In case you haven't guessed I love colours! Choosing the colours of my piece is often my favourite part. I play around a lot, I start by splashing colour all over the canvass leaving no white patches, then build up from there, I often zoom out and look at how the piece works as a whole. Coloures are relative to each other, so always think about how they work together. Remember to critically asses your colour choices, just because she has a red top and blue jeans doesn't mean you can pick any red and blue and it'll look good, see how they work together and with the background and lighting. Colour is very important for establishing mood. Do you want a light airy and pastally piece, or darker and grungier theme? Think about what your colour choice says. I use the 'Adjustments' sliders in photoshop to edit colours at this stage, see how it might look if I added a blue hue and what not. Establish where the light is coming from early on, then play around! How do you make things glow like that? I really enjoy adding glowing elements and interesting lighting to my work. To have a successful glow you probably want a darker background so the light stands out, have a bright center of the glowing thing; it's light gradually fading to the darkness as the light emanates. To make it convincing you need to have your glow interacting with other elements, say it's a girl holding a glowing flower, it's important to not only make the flower glow but to have the light emitting hit her face, subtly casting its colour over her features, and stronger glows may even create shadows. For drawing where it's more painted I usually use two layers, one with the main painting and one as a 'working layer' which I paint onto, then I merge that layer onto the main canvass when I'm happy with whatever I'm developing at the time. Now look at a picture of an ant: core-company.com/wp-content/up… How similar was it to the one you imagined? You probably got that it had a body and 6 legs and antenna, but did you remember it has three parts to its body, with the legs coming from the middle, an the shape the're angled at, and its pincers? This is why practicing from references help, often you think you know how something looks when you don't, this is especially true for the human body. I recommend doing some life drawing studies, there are tools like this: artists.pixelovely.com/practic… and Posemaniacs which give you people posing and a set time to draw them in, they can really help deepen your understanding! Usually I don't work from an exact photo for proper painting, just if I'm struggling with a pose or hand I get my boyfriend to take a photo of me in that pose and have a look at how a real body works! I spent my first years in art never drawing from life, I found it boring and probably would have dismissed my older selfs advice, but that's cool. Draw what you enjoy! How did you get your 'style'? 'Finding your style' seems to be a common worry among new artists. I urge you all to experiment as much as possible, don't worry about settling on something as you naturally will. And then probably once your there and have done a few drawings in that style you will want to move on as you've plateaued and want a challenge. You work will probably be identifiable as yours even when you don't consciously 'style' you art. All the people who have ever shown me their drawings and said: 'How do I find my own style?' are people who have not drawn enough to be particularly good at drawing yet. They think the problem is style, but the problem is substance. The cure: Draw more. Draw everything. Draw often. Why worry about finding you own style if you can't draw well yet? How are you possibly going to make a face interestingly stylized if you can't even draw an actual face properly? Which drawing tablet do you use? Do you have any tutorials you learned from? I did look round the net for tutorials as I was learning, though often the quality of them was not great. Everything by Andrew Loomis. He is one of the go to guys for instructional drawing, a warm encouraging manor, and more helpful instructions than you can shake a stick at) try him first if you're wondering where to start. I have yet to find a really excellent 'How to draw Manga' type book, though the original Japanese ones were the best I've found. It's only relatively recently in my artistic journey I've begin properly studying and learning from references like these. For about 10 years I had no interest as I just didn't enjoy it. I would almost certainly be a technically a better artist if I used them earlier, but I was worried my stuff would lose my stamp and heart if I was learning fundamentals from others. I think it probably wouldn't have. But now I have the drive to improve as it's my career, not just my hobby. I'm not sure if I should study art, would you recommend I go to college/uni to learn? I have never formally studied art, so am not the best source of information on art schools! Sorry! What Art Schools will give you is time to focus on drawing, and guidance. Now these two things are key to an artistic career. But time to focus on drawing, and guidance, are things which can be achieved without art school. It depends of your drive and situation. One good thing about school is the resources; paints, brushes, tools, teachers, it's a great source of stuff. Also the contacts you might make, as you are all artists together, and have shows and galleries put on for you. But your success is never guaranteed whatever path your choose. Ultimately a client will select you based on your portfolio, that you went to art school is inconsequential if your drawings aren't good enough for them. I don't think anyone would decide not to buy a print of mine they liked because I didn't go to art school. I am proud of the fact I'm self taught, and think it shows my genuine love of drawing. You just have to decide what works for you! How did you get your art known online? I've been on deviantART for 11 years now and being active in the community helped, commenting, chatting, critiquing and being generally involved led people to my page and then perhaps they liked the art they saw there. Their feedback then helped me improve. If you want to get feedback on your art you can do things like swapping critiques, post in thumbshare forum, or join a critiquing group. You get a lot of comments on your art, do you read them all? I comment on your drawing but didn't get a reply, why not? I don't reply to some questions because the answer is here in the FAQ, so I don't have to repeat myself many times. Do you post your art on any other sites? I don't like your art. I am humbled by all the support my art gets online, and not by a long way arrogant enough to think everyone who drops by my pages likes what they see. Art is highly subjective, and I know I draw things not everyone enjoys looking at, and I know am lacking in skills in certain (large) areas; I am trying to improve and everyone has different tastes I am very open to critiques and love to hear honest opinions. Do you sell prints online? I do not. I create art for the love of it and to communicate, if someone else is controlling my pen with their wallet I just don't enjoy drawing. Can I use for your art for a school project? Will you answer some questions for me? Though I am sorry that I do not have time to answer each persons questions individually. But please do make use of this FAQ, as I hope it answers many of the things you want to know. Will you review my art? Can I draw something inspired by you? That really means I spend a lot of my time looking for my pencil. Are you coming to X/Y/Z convention? I'm a convention organiser, would you like to come to our Convention as a guest/ speaker? Possibly! I've previously done talks and workshops at conventions on many aspects of art and creation. I'm always interested in being an invited guest to a convention. I'm an artist selling in an Artists Alley, do you have any general convention tips? A great thing to do is make friends with your artist table buddies, if you go on a tea or lunch run, ask if they want something picking up (I love it when people do this) Remember the artists around you aren't your competition, they are your friends and colleges, they are in the same position you are. The artist community is very small, so don't be silly enough to bad mouth another artist behind their backs, you wouldn't want anyone doing this about you, so extend the same courtesy. Oh and don't under price yourself, you art and time is worth something. Can you help me with this specific convention issue? Can you recommend a convention to me? How do you get into conventions? What should I bring to an Artists Alley to sell? I get asked a lot about a lot of different conventions! Your prints are really nice quality, where do you get them done? I invested in some great quality equipment, a large format Epson printer, archival inks, heavyweight premium paper. I do the printing myself, so I can be sure of the quality and in full control of the colour output. I would recommend when your start to find your local independent printers and get your first batch done there, as they already have the equipment and knowledge, and will be very happy to help you print what you need. Only invest in equipment when you know it'll be worth it. How do I become a professional artist? There are many factor involved with being able to make a living off your art, where you live, what kind of thing you draw, do you want to freelance or have an employer etc. I wish I had the answer for everyone, but you have to figure out what works for you. I have little insight into the so-called 'real' art world. The dream to become an artist often starts long before the skills for that goal are anywhere near ready. Be prepared to work for your goal, it will probably take years, but don't let that put you off. Ask yourself where you would want to be and then make small steps to achieving that. Drawing well will be at the heart of your success, if you are serious about a career you should practice as much as possible so you art stands out. I want to be an artist, any insider artist tips? Enjoy the drawing process, as you will always find mistakes in the finished result. Have a positive attitude, if you see mistakes, note them and work out how to not make them in the next drawing. Drawing is very sedentary, so make sure to get enough regular exercise, it will also help stop back and arm ache. I start every morning with stretches and I love it! Try and conduct yourself in a professional manner, there will be times when annoying or illegal things happen to your art, deal with them in a calm and private manner where possible. One of the most important last: Don't do work for free. You de-value yourself and the industry you want to get into. I am from a well known company/organisation/brand, and would like to work with you, how can I contact you? While I don't do commissions, I understand that there is scope for possibly working together with establish companies who share my vision. Can I use your work for tubes? Can I use your art for my avatars or icons? If you use my work for your avatar, signature or icon on dA or elsewhere please say in your signature 'Artwork by DestinyBlue' and include a link back to my gallery. Can I Share your art online? I love my art being shared! Please always remember to credit me and link people back to my page. You may only share my work if you provide credit. Please don't edit or crop my work, especially never remove the watermark. Please re-blog from me rather than re-post where you can. Can I use your art for something personal? Yes~! You are very welcome to print off small copies of my art for your wall/scrapbook, or save files to your computer, perhaps put it on a card and give it to a friend. I'm happy for you to use it in a class project, or have it as your phone or computer wallpaper. I put my art out there for you to enjoy Pretty much anything so long as you are not making money from it. Can I use your art for something commercial? No, never. My art may not be used by you for your financial gain. You may not use my art on a product you are selling or advertising. You may not offer digitally my art for sale. This includes selling 'adoptables' of my work or lineart, or traced/copied versions of my drawings. Never offer my work for sale in any printed or physical medium. I can, and will, peruse legal action against anyone who infringes my intellectual property for their financial gain. Can I feature your art? I found your work posted on another site without credit, what should I do? Can I colour your lineart? That's why I put them up! I learned a lot from colouring others line art, and so hope to pass on that to you. Do you have rules for colouring your lines? In the description there are the rules of colouring. They are fair for us both, so please be aware if you don't follow them I will ask for it to be removed. The most important ones are to always provide credit for the lines, and never remove my text. Will you review my finished colouring? Sorry but I get so many I can't comment on them all, if you are looking to improve ask your friends to help you. Will you make X/Y/Z a lineart? England. All of it. I loves it. My roots are in the capital and my heart is in the countryside. Is your hair really blue? Yes All over bright aqua blue. I bought some bright blue hair mascara when I was 12, and then at 15 dyed my hair permanently blue. I'm a natural bluenette. People sometimes think my aim is to stand out, but really I do it to fit in, that is, with myself. I've had blue hair in my mind from since whenever I thought about hair, and now I have blue hair. It may seem weird to you, but it really is one of the most natural things for me. Is DestinyBlue your real name? I chose DestinyBlue (all one word) as a online name soon after that. I always liked the idea of 'Destiny'; where as 'fate' means a predetermined outcome, 'destiny' gives agency to the participant. You shape and make you own destiny, I've always been a strong advocate of this; you can't choose where you can from, but you can choose where you're going to. What would you be if you weren't an artist? Any random facts about you? I really really like tea. I have over 100 different types. I was at a convention and a girl I was chatting with kept calling herself a 'fan' of mine. Truth be told, I've never really liked the word 'fan', and find it slightly uncomfortable when used toward me, though her sentiments were very heartfelt, I told her this and she said "Well I'm on Team Blue, whatever it's called"
Team Blue! I loved it! I have a TON of people I would like to get back to, and found myself answering the same questions again and again, so hopefully this will help me talk about the interesting things more! Thank you so much for all of you loyal support guys I write this for you. Any more questions you would like me to answer? Since you're still going to art conventions, by any chances are you coming to Michigan (That's where I live) or anywhere close to Michigan? I would really love to meet you! Thank you so much for writing all this out for us! The info in this FAQ has allowed me to answer all the questions I need to write an illustrated essay, all about you! I am curious about something, since I didn't see it here. If it was there, and I didn't see it, my bad. Is it possible you could give advice/critiques on artwork? When is your store going to open again? I have three of your prints on my wall, but I have another three I would like to buy (and helping to support you after all the good you've done me, even unintentionally, is a huge bonus). Ideally I'd like to get hold of them before May, when I'm going to move apartments. I'd like to be able to make sure I've got space on my walls when all the furniture goes in place. Im DEFINITLEY apart of TEAM BLUE!! I adore your work, I very much do. I just wanted clarity on using your paintings. I am a poet and would like to write a book with your illustrations. Can I use them and credit you in it? I have huge respect for you. Amazing art, amazing kindness. I love reading these sorts of things, thank you for posting! I always wondered how you got your name and now I know which is great! Hey, how tall are you? :3 I just loved your art! I met her a couple of years ago at comic-con she's super nice! *fist bump* Fellow dye-head! Which brand or brands do you use across the pond? Can I use your stuff as a reference and then sell my work? I don't ever straight off copy something unless I drew it myself. I don't even like tracing my own photography lol. I love your coloring style, and this specific drawing: pre07.deviantart.net/e52b/th/p… I wanted to use as a reference and make my own drawing based off of it, different theme, and most likely another color scheme, but reference it, would that be okay? what is ur REAL name? and where in the convention in paris will u be? Such an awesome detailed faq to the minds of an artist. Thanks for sharing. I was curious you posted a picture to instagram of face sketches. You said you used a website that you can set a timer for 2 minutes. Could you tell me the name of that website? I want to ask : Can i make some part of your artwork "Damages" for my art competition? I am only drawing the face . Please reply this because i got to submit on this monday! If you don't mind me asking, why don't you do requests? Unlike some of us here I will not try and convince you to change your life choices. I will say that it's unusual you have a no commissions rule. I don't see that with really talented folks much. Ok, here's a scenario for you. You've known someone a long time and they want a commission for a special event in their life. Like say, a picture on their wedding cake or something on their graduation cap. You are good friends with them and they will pay ANY price. Would you consider it just for that one individual? hehe alright But you should consider doing commissions mebbe. I know plenty of people who would easily pay 100 for a piece. Can't wait to see more from you! Christmas dinner in the Great Hall Hogwarts set!So I was super lucky to get tickers to go and have dinner at Warner Brothers Studio London, in the Harry Potter Great Hall set! I often feel like apologising at the start of these posts: Sorry I've been gone a while, sorry I haven't replied to everyone. However I'm trying to make a conscious effort to not apologise for taking care of myself; when I'm feeling low it's just not as possible for me to interact with the world how I'd like. Basic activities like making food, showering, and housework take up so much energy that all I have left I have to put into my recovery, engaging in things like exercise, meditation and therapy. Things have been... well tough. I haven't needed hospitalisation again since my stay in February; but things have not improved as fast as I'd hoped. I am better in the sense that I am no longer suicidal, and I'm pushing forward, but the black dog seems to be keeping pace however fast I run. No new drawings...an explanation.The thing about getting better after your world falls apart... is that things don't come back in a predictable order; you get given bits and pieces at random, fragments of yourself here and there, you know it will all come together eventually, but you don't get a say in whats dropped back when. The drawing thing has been tricky though. Drawing has been such a huge part of my life, and that was taken away along with everything else I loved by the mental illness. It hasn't come back fully yet. I can sketch, and I've been sketching a lot, but my focus and concentration to work on a full piece has been impaired. Its a fine line between coaxing yourself to do something, and forcing yourself from a bad place. Hi I’m Andrea Dotta: a Pro comic artist and animator and one year ago I had the insane idea of making a powerful webcomic to show my works to more people as possible. Now I’m in a positive development towards my goal. If you want to do a webcomic, always do your best as their are millions of webcomics on the internet. In this article, I would like to share the things that I’ve learned this year so I hope you will get something from me. PE. 50 Ways to get inspiredHere are 50 ways to get inspired in many ways! There are soo many ways to get inspired to draw such beautiful drawings no matter your level. Every picture mostly starts with an idea and an inspiration. But for those who still want to learn more ways to get inspired here are 50 ways presented to you NOW! We would love to hear feedback from people if they are using this! Have you entered something listed here? Have you won something? Are you actively using this? We want to ensure we are giving the community something worthwhile here- and please don't forget to add opportunities you find to the list too- the more people adding things, the better! As writers, we always talk about “getting that piece published sometime” or “maybe submitting to a few places”, but how many of us actually eat our words and get on with it? It was suggested that perhaps we could help nudge you guys by sharing with you the opportunities we know of. Personally, I'm not well explored, but what I do know is that the community is! Therefore this journal is a chance to share the opportunities you find. WE ASK THAT ALL LLAMA DONATORS GIVE A LLAMA TO EACH PERSON WHO PLACED IN THIS CONTEST. 1ST, 2ND,3RD, 4TH AND 5TH. The winning designs will be reproduced at our discretion in the form of chibis, half body, full body etc. to be used on product designs which we will sell in a cafepress shop for our fans to purchase! All the proceeds will be used for future contests and the like So if you want more contests, better prizes and some toys to boot then buy some products! FYI the shop has only just opened so the amount of products we have are very limited. Challenge me, art-wise!It took a while to realize that, no matter how pretty the last few sketch-dumps where, I wasn't really learning anymore. Sometimes a large user-base just feels like pressure. And pressure makes it feel like you can't afford to fail anymore. And you'll stay inside your comfort zone. And with result. Last years improvement was close to non-existent. But I realize now that staying in my comfort zone will not get me anywhere. The lack of improvement and recent login issues made me think. So I went back at where I came from. I took a pencil and started sketching again. Real, ugly sketches, with a lot of wobbly lines and such. Anatomy, dogs, and various other things. I realize now; I want to keep this up. Really. I want to draw things that are (slightly) out of my comfort zone, in order to learn. From 500 to 20.000 watchers...... in just one year. It was a cold day in February. I can still remember that day. It wasn't that busy at my job. Just another day of mostly waiting for feedback. So I took the liberty to surf around the internet for a bit. Like every day before, I checked DeviantArt. I had posted some art some while ago. I submitted it to some groups, but didn't quite get the response that I hoped for. Let alone; the feedback. It's hard to get feedback on your art. Nowadays most people just fave and run, or tell you that your work is awesome (which is sweet, of course) without any further explanation. Most of the art forums that I used to reside on, where either dead, or I'd outgrown the user-base so much that I was at the point that there weren't any more talented users that could give me feedback anymore. If I had to wrap it up in just one word: Frustrating. That's what is was. Promote your art (on DeviantArt)So you have your awesome art project that, you feel, the whole world needs to see? So you've signed up to be a DeviantArt member. Because, DA... that's where all the cool artists reside... isn't it? So you've posted your art. You've been here for a few weeks, or perhaps even a few months or years. But despite all your efforts, you still get close to zero comments. Why? What went wrong? It could be your art is really bad. But most likely, you're not approaching this subject the right way. Becoming well known on DA doesn't only rely on your art skills. It also relies on your marketing skills. And let that be exactly what most aspiring artist forget about. Here I listed some simple tips & tricks that will help you get out art out there, and become better known on DA.